William Floyd High School students enrolled in the Business Academy recently competed in the Future Business Leaders of America regional competition at Molloy College. Mastic Beach, NY - March 3, 2013 - William Floyd High School students enrolled in the Business Academy recently competed in the Future Business Leaders of America (FBLA) regional competition at Molloy College with eight students placing in the top three in their respective categories qualifying them for the New York State Competition in Rochester this April. Congratulations to the following students: Karen Benitez, Marketing (1st place); Otsmaro “OJ” Martinez, Marketing (1st place); Marlene Rodriguez, Personal Finance (1st place); Cassandra Scala, Client Services (1st place); Michaela Surrey, Public Speaking II (1st place); Michael Walker, Parliamentary Procedures (1st place); Kayla Heffernan, Business Law (3rd place); and Kristina Rodriguez, Accounting I (3rd place). The William Floyd High School Business Academy encompasses a comprehensive program of challenging courses in career preparation and technological literacy that are enriched with a variety of extracurricular activities. Their half- and full-year courses complement academic study and provide opportunities for students to satisfy many of the commencement level NYS Learning Standards. Courses are designed to prepare students for post-secondary study and/or entry-level employment. Pictured: William Floyd High School students who placed in the regional FBLA competition and qualified for the State Competition in April. 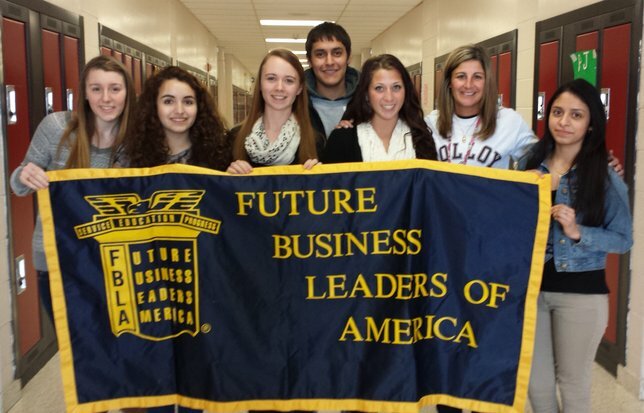 From left to right are: Michaela Surrey (junior); Karen Benitez (junior); Kayla Heffernan (senior); Otsmaro “OJ” Martinez (senior); Kristina Rodriguez (senior); Ms. Jacqueline Giacalone, WFHS Business teacher; and Marlene Rodriguez (senior). Not pictured Michael Walker (junior) and Cassandra Scala (senior). Subject: LongIsland.com - Your Name sent you Article details of "Eight William Floyd High School Students to Compete at FBLA State Competition"